Some long (long!) time ago, I once had a rather peculiar ritual in early May. Every morning on my way to work, I was stopped dead in my tracks by a bunch of white irises in bloom in a curbside flowerbed. Being who I was (and still am), I had to bend down and sniff them. Some irises have no scent to speak of, but these beauties certainly did, epitomizing everything I love about iris: that cool, measured poise that belies their extravagant flowers. At that same time of my life, I also lived vicariously through the only ‘perfume’ I owned, the print catalog of a New York purveyor of all things fantastically fragrant – the Greenwich Village store Aedes de Venustas (the House of Venus), whose stunningly photographed wares ignited my imagination in ways both great and small. By the time I lost the catalog, it was dog-eared from perfume dreaming and dilapidated from all the times I’d read it from cover to cover. Lo and behold these many years and strange trips later, and now, a favorite flower and a fond memory come together in – what else? – a perfume released in 2013, Iris Nazarena, a fragrant ode to the iris variety bismarckiana that blooms near Nazareth in Israel. 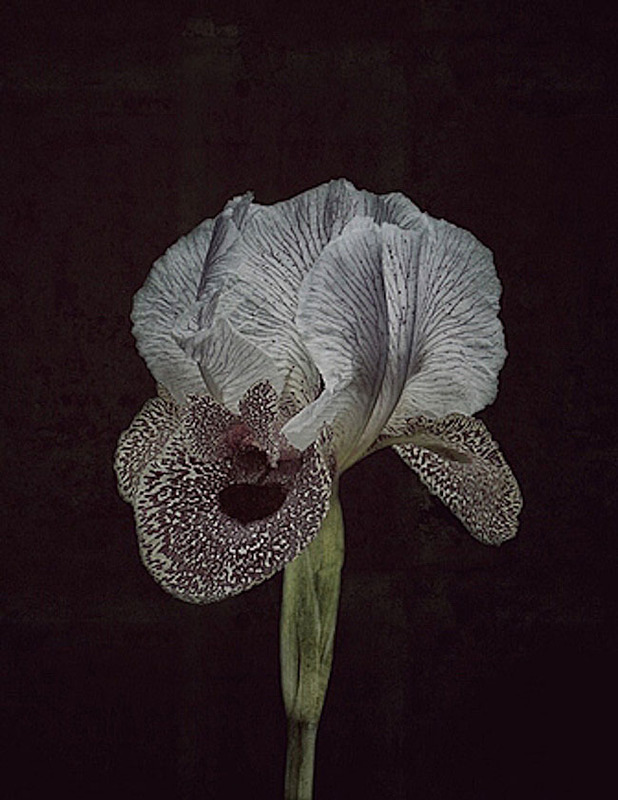 Iris – actually, the cured fatty ‘butter’ of the rhizomes known as orris – is a bit of an olfactory paradox. The blooms may resemble the dolled-up Folies Bergères showgirls of the floral world, but the scent of orris gives nothing away. Some find it too cold, too haughty, too earthy, too doughy, too stern, arrogant and difficult to love. Yet ever since a mohawked punk in a few hundred pounds of black eyeliner and Doc Martens stomped into a Copenhagen department store in desperate search of beauty and waltzed out in a cloud of Chanel no. 19, I have loved and adored iris for precisely that chilly, daunting hauteur. Henri Robert’s Chanel no. 19 in fact was perfumer Ralf Schweiger’s starting point with Iris Nazarena as ‘the benchmark iris’ (I’d add Maurice Roucel’s Iris Silver Mist to that benchmark list), but Ralf Schweiger did far more than eye no. 19 over his shoulder, for Iris Nazarena is very much its own and unusual brand of orris butter with extras. For one thing, it’s as dry as any Levantine desert right from the start, utterly devoid of the rooty-earthy-carrot facets that have ruined orris for so many. This is a perfume full of air – air for the notes to breathe, air for the story of an uncommon jolie-laide flower to unfold upon my skin. I detect something bitter and green, fruity and rose-tinged on application, but there’s nary a fruit cliché to be found nor any sweetness at all. Instead, also from the start, a beautiful curl of the ashy-cool smoky incense accord that appears to be a running theme with Aedes de Venustas’ perfumes unfurls off my skin with a suggestion of leather – buttery-soft glove leather. Then the iris arrives wrapped up in a deft, warming touch of clove-y spice, with lots of space to roam through that bone-dry desert and show its stunning face. Some time later, it fades away to more and slightly greener (the vetiver? The patchouli?) floral-edged leather and incense before it exits stage right after about four hours. I have to add – being more than a little averse to oud, or at least the overused synthetic and barnyard varieties – I detect no oud at all. It’s not hard to squint and see a few similarities between the benchmark reference (no. 19) and the end result, but Iris Nazarena skews much more unisex and far less floral to my nose, yet even after comparing it to vintage no. 19, I can’t consider it anything other than its own singular perfume. A complex synaesthetic study painted in sublimely refined, elegant, arcane hues of smoky gray that is all of a piece and containing all the marvel of a bloom in the desert. Think of Iris Nazarena as… the eminence grise of iris. Containing just enough of orris’ steely reserve, all of its mystique and more than a little of its charm, it has nothing to prove except its beauty. Which is more than enough, and already far more than this iris lover deserves. My one minuscule gripe was the sample vial it came in. For something I’d fall this hard for, I dearly wish I could have sprayed it to grasp something of its scope and breadth, especially with a perfume that at least on my skin plays out as airy as Iris Nazarena does. Image taken from the Iris Nazarene press release. Disclosure: A sample of Iris Nazarena was provided by Beauty Entreprise for review. For which I thank Shirley and Olivier. Ralf Schweiger. And last but never least, Karl Bradl and Robert Gerstner for being at least as uncompromising as the iris that inspired them. Notes: Iris, ambrette, rose, juniper, star anise, clove, leather, incense, vetiver, patchouli, oud. Aedes de Venustas’ Iris Nazarena is available from the Aedes de Venustas’ website and First in Fragrance.